In the wake of natural disasters, new trees bring communities hope and healing. Trees play a vital role in our communities. So when natural disasters strike, the loss of trees is much more than meets the eye. The Community Tree Recovery program was created out of the great need for trees in the wake of natural disasters. 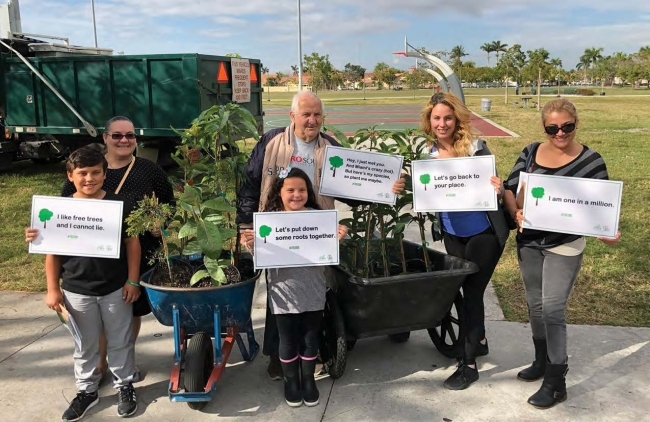 Through this program, residents who lost trees in major disasters caused by wildfires, floods, hurricanes, tornadoes, and insects can receive free trees to plant in their yards. This work is critical for re-establishing neighborhood trees…as well as a sense of community. More than 5 million trees have been distributed through the program since its inception. This year there were 13 active Community Tree Recovery campaigns, with 367,010 trees distributed. One such tree distribution was held in Denham Springs, Louisiana, in the wake of a massive flood that devastated much of the Baton Rouge area. In 2016, the residents saw 20–30 inches of rain over the course of three days. The flooding caused damage to more than 146,000 homes and took the lives of 13 people. View the Arbor Day Foundation Annual Report in its entirety.